I am currently enjoying a three month paternity leave with Sofie and Elvira in Australia. Besides visiting Elvira's family (two sisters and their children) we also get time to climb and do some sightseeing. 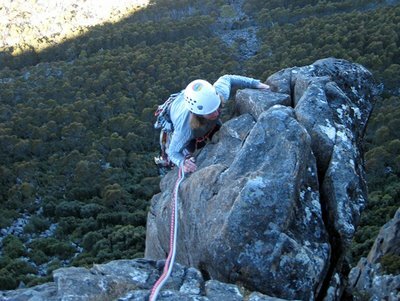 Last Friday we did our first climb in Australia, as we climbed the popular route Fiddlesticks (grade 14, 55m) on Flange Buttress, The Organ Pipes, Mt. Wellington (1270 m), Tasmania. The mountain is situated just outside the capital Hobart and the rock face sporting 450 routes (trad, bolted and mixed) is actually visible from Gabrielle's (Elvira's oldest sister) house! The Organ Pipes on the East face of Mt. Wellington sporting 450 routes (trad, bolted and mixed). Gabrielle was extremely kind to offer to take care of Sofie while we went climbing and we thus picked the easiest 3-star route on the mountain Fiddlesticks to familiarize us with the mountain and the Australian grading system. It took us a little while to find the correct access to the route navigating boulder fields and thick bush, but after one detour we found the route which is easily recognized by two big parallel cracks in a corner. Elvira negotiating the boulder fields on the access route. Hobart is seen in the background. Fiddlesticks. 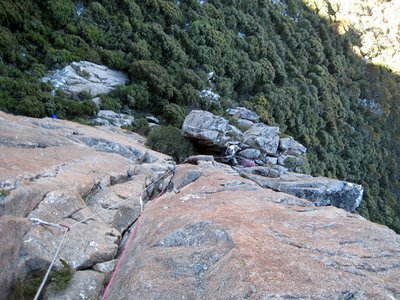 The first pitch climbs (30 m) the two parallel cracks in the corner above Elvira to a notch left of the tree seen on the route. 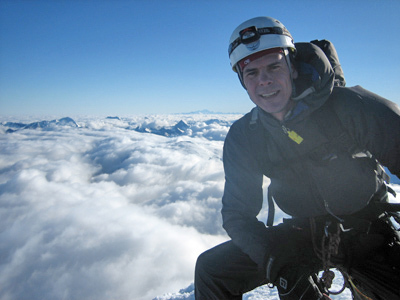 The second pitch continues on the right crack for approximately 15 m where after the route traverse left onto an exposed arête to the top. 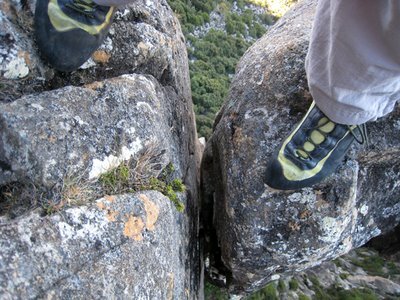 The climbing is great albeit the rock is a bit loose and some flakes are hollow. I thus take great care while I lead the route in order to put the protection (mainly friends and some nuts) in the good part of the rock and not to dislodge any rocks onto Elvira belaying below. 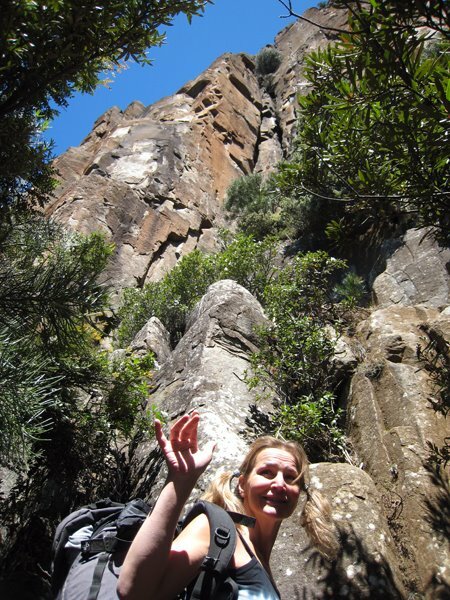 I climb with a small backpack containing extra clothes, water and snacks which turns out to be a bit of a drag as the corner provides good body squeeze rests - which however are hard to use with a backpack on! 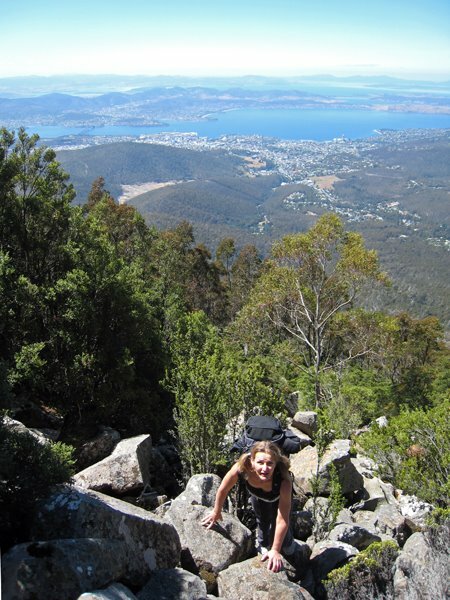 The belay on the top of the first pitch provide a stunning view of Hobart. 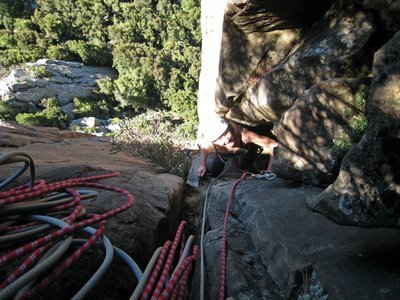 Elvira yells "This is why I love climbing!" as she gets on top of the notch and take in the view. Elvira at the first belay at the top of the notch. A great position with an awesome view and exposure. A picture of my feet on each side of the detached arête at the top of the route. Elvira making the last moves on the route. 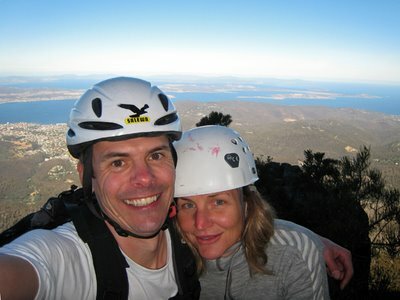 Elvira and I at the top of Fiddlesticks with Hobart and the Tasmanian Ocean in the background. Video of the fantastic view from the summit. All in all it was a great route with almost an alpine feel to it. P.S. Australian grade 14 corresponds roughly to French grade 5. Great to read your little write up of Fiddlesticks. We were there a few years ago (live in Sweden now) and still have fond memories of it, probably the highlight of our short trip to Tasmania. Bush bashing to find the start of it probably took longer than the actual climb. :P Just joking... but almost. 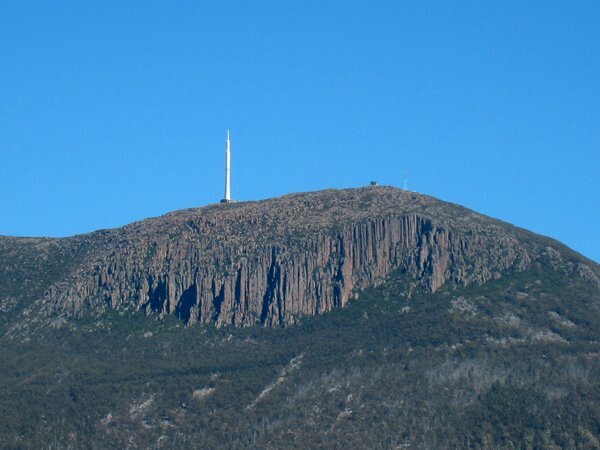 Hi, May I use a thumbnail of your image of Mt Wellington- it is an excellent pov for what I am looking for - will make link to your blog in the article.